Ruk jao Zainy, mat jao! Let me see now. 27 episodes of roughly 40 minutes each – it took our ‘shehzada’ (as Mehtaab had called him) Sherry all of those minutes minus the very last 30 seconds of the final minute to utter the words that most of us had hoped (and others wondered whether) he would utter! We were left guessing to the last minute how this drama would end and I will admit the way the events played out in this last episode was convincing to an extent. Zainy’s CSS result – how long does it take for the result to be announced by the way? She went through an entire pregnancy, initial months of motherhood – before her result was announced. Zainy is seen struggling financially with Ahmer not being able to provide for her and her son Mustafa and she sells jewellery to make ends meet. The CSS result gave her the confidence she needed and finding Ahmer still involved with Bina served as the last straw and she finally walks out on him. Ahmer makes no move to stop her either. It was heartbreaking to see how Abba, such a positive, proactive and encouraging character had become a broken old man. I loved how Zainy seemed to outwardly grow a thick skin to ward off Novera’s constant jibes and gave her all to help Abba regain his strength and will to live again. Novera is so deeply submerged in her insecurities and jealousies that let alone Zainy and Abba she will not even let her own marriage flourish. Ah, but there is one relationship that she works on and fat lot of good that has done her except well, land her the nikkah nama to Sherry – and that is with Nigaar Apa. I was very surprised at Mr. Novera, oops, Sherry’s attitude in this episode. It almost appears as if Sherry can not look past his personal feelings of hurt and lurrve and rejection to forgive Zainy or at least give her a chance to let her stand on her own feet. He was hostile when she came back but bore with her for he recognized she gave Yusuf what he and Novera were unable to give. But the way Novera sent Mustafa with Ahmer upon Abba’s death and said Sherry has packed up her stuff and she should go back to her ‘own house’ seriously made Sherry lose some major brownie points with me. For all of Zainy’s faults, for all of Sherry’s amazing personality – I was fast losing patience with his firm stance of not letting Zainy return. Tough love it may have been but I felt how Zainy’s departure was forced from their house upon Abba’s death was a bit extreme. 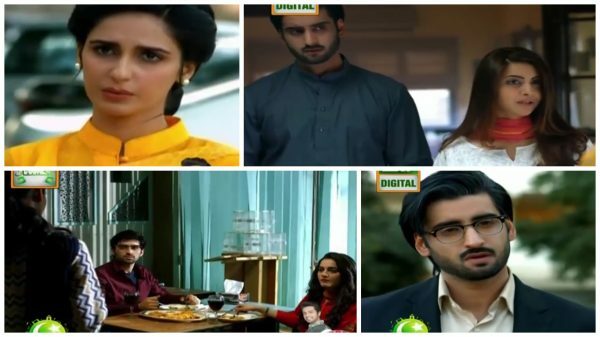 Mehtaab left two things as her legacy in this episode – her words of wisdom when Zainy was beside herself with despair upon Abba’s death ‘aap jo bhi faisla karein us ski zimadaari bhi khud he utthaana’ and secondly – her beehive, LOL! When Zainy went back home and left Mustafa with Taayi I wondered if she left him with her for good. Fast forward nine years and Sherry has aged and comes to a festival (a very empty festival I may say) to hear Zainy speak and their conversation answers our questions. Sherry’s ‘I have 3 sons and 3 daughters’ left me gobsmacked and I thought okay 6 kids and in Canada with no naukar chaakar would have finally made Novera too busy to cause trouble but turns out he only made that up and he has a daughter but Novera has left him and remarried. Zainy also left Ahmer (duh!) but thankfully her son lives with her. I found Sherry’s responses to Zainy’s pertinent questions very lame, I am sorry to say. I find he was too hard on Zainy and this whole ‘her house, my house’ really did do my head in. Yes your husband’s house is supposed to be your house but your parent’s house is not a stranger’s house either!! Novera with her constant obsession of repeatedly sending Zainy back to her own house stemmed from her insecurities but Sherry harping the same tune was very annoying. Yes, his attitude finally made her get up and make something of her life but was that his intention really? He kept telling her to go back to Ahmer – not to stand on her feet and leave him if that was what she felt she needed to do. Anyways, Sherry finally musters up the courage to ask Zainy to not leave (standing ovation please!) and so all’s well that ends well. Maybe. I had wondered how Novera would fare in all this? Does Sherry leave her for Zainy? How does she end up leaving Ahmer – if at all? So yes the events in this episode seemed to flow in a fairly believable sequence. I have to say I have enjoyed watching this drama and am amazed it stretched across 27 episodes and yes it could have been wrapped up in less episodes but it was all good. Agha Ali has truly impressed me with his acting in this play as has Seher Afzal. How she effortlessly played Zainy, making us frustrated with her and feeling her pain later on. I loved loved loved Abba’s character, although a bit stifling at first, the way he stepped up after Mehtaab’s death was just beautiful and Nadeem Baig did a tremendous job. The dialogues and direction were good too and one thing that truly surprised me was how a Big Bang Production was not very Big Bang-ish and I feel that statement is self explanatory. I have enjoyed reviewing this play and thank you to all my dear readers who have regularly read my reviews and commented. What has stayed with me at the end of this episode is that biryani that Ahmer and Bina were enthusiastically digging into and thankfully I have made the same for dinner so I am off to satisfy the sudden hunger that brought on, LOL. Team Sherry and all others – what did you think of this last episode? Would love to hear your thoughts!